Simple to control and eye-safe laster pointing system for people with complex needs. Communicate with your medical providers and family, use your favorite computing device, or control your environment with an easy-to-use, eye-safe laser pointer and specialized keyboard, now with a Bluetooth wireless interface! The video on the left demonstrates the power of safe-laser pointing for people with very minimal movement capabilities as well as the features for the new Bluetooth version. 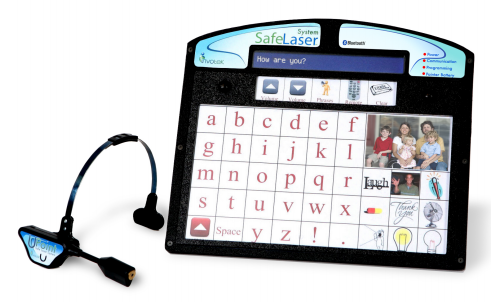 A single word for describing the Safe-laser System is “simple.” Young children find moving the laser light easy to do. Adults who have suffered a brain injury often find moving a light easy to do. In fact, our research has demonstrated that some people diagnosed with “locked-in syndrome” actually learn to move their head using our safe-laser technology. The key is simplicity. The Safe-laser System provides a continuum of access options. Start out just pointing the eye-safe laser* at a letter board or images and let a communication partner interpret what the point means. Then progress to a “call button” that lets someone know you want to tell them something – and you point to letters while they interpret. Then, using dwell or a secondary switch, you can write out messages to the display, or access recorded speech on a key-by-key basis. You can also control the TV. Finally, connect the Safe Laser System to an inexpensive Android tablet and use our LaserChat and LaserChat Pro apps to achieve text-to-speech output without or with word prediction. It is all possible with the new Safe-laser System – simple light pointing, spelling, Bluetooth or USB computer access, speech output, and environmental control. And it is easy to do. The Safe-laser System isn’t for everybody, but it is simple! *The Safe-laser System is a Class 1 Laser Product, the safest FDA classification possible. Help people who have had a brain-stem stroke to relearn head movement. Provide an easy to access "low tech" communication board accessed by light (laser) pointing. Provide up to 60 minutes of digitized speech output. Type messages on the display with or without word prediction. Use the laser keyboard to control a computer, tablet, or phone through a USB cable or wirelessly via Bluetooth. Select TV channels, turn on and off the lights, or operate an automatic door opener. Use our free Android App and an inexpensive tablet to achieve text-to-speech output. The Safe-laser System can be used "stand alone" or to interface to computers, tablets, and phones as a standard USB keyboard or a Bluetooth keyboard and mouse. If you are looking for a good way to control a computer cursor using small or large movements of fingers, toes, or a head, AccuPoint may be a better solution for you. Please contact us if you have questions. We're here to help. * The Safe-laser System is a Class 1 Laser Product, the safest FDA classification possible. suffered a brain injury often find moving a light easy to do. In fact, our research has demonstrated that some people diagnosed with “locked-in syndrome” actually learn to move their head using our safe-laser technology. The key is excellent visual feedback and simplicity. The Safe-laser System with Bluetooth provides a range of access options. Our configuration software lets you program the graphics and function of each key and you can save up to 15 keyboard layouts within the Safe-Laser Keyboard. Start out pointing the eye-safe laser at a letter board or images and let a communication partner interpret what the point means. As your head control improves, program a “call button” that you dwell on to tell someone you want to communicate – and you point to letters while they interpret. Then, using dwell or a secondary switch, you can write out messages to the display, or access recorded speech on a key-by-key basis. Computer and tablet access are also possible using the USB (wired) or Bluetooth (wireless) connection. You can also control the TV! The Safe-Laser System makes it all possible - light pointing, spelling, computer access, word prediction, speech output, and environmental control. And it is simple to do. The Safe-laser System is simple from the user's perspective, but it is a sophisticated device. The video on the left provides a quick overview of the system. The large area laser-sensing surface is unique in the world (to the best of our knowledge) and was designed specifically to meet the needs of people with disabilities. It works in a broad range of lighting environments, from darkness to near direct sunlight. The laser keyboard also has a standard VESA mounting plate on the back, making it easy to mount for use in bed or with in a wheelchair. The safe-laser pointer is a Class 1 Laser Product and has a docking station on the back of the laser-keyboard. Charging the laser-keyboard simultaneously charges the laser pointer. InvoTek's safe-laser is the only Class 1 Laser pointer available in the disability field, ensuring the eye safety of users and bystanders. Printed on the on-screen display (letters, words, or combination of words). Sent to computers, tablets, or phones via USB or Bluetooth. Spoken from two rear-facing speakers. Activated by the built-in universal remote control. The time that the laser must target a cell in order to activate it (the "dwell" time) is also configurable. Keys can also be defined as a system function like clearing the display or adjusting the volume of the speaker.